It’s time once again for me to preach to the masses to encourage more face-to-face time together. Last year’s run-down of recommended boardgames was a great success. Here again are some great examples of boardgames to get you and your family gaming. You might not find all these titles at your local mega-mart but many can be found online or in a friendly local game store. Those new to the world of boardgaming may find a bit of a sticker shock as some games are pricier than new release video games, but good boardgames will provide many more hours of entertainment than most video games. Boardgames are also relatively timeless so they can be pulled out years from now and provide the same level of enjoyment. In that vein, feel free to delve into some past year’s guides for 2010 , 2009, and 2008. For each game I’ve provided the number of players, retail price, and expected time for one game. Note that often these games can be found for 20-30% less than the MSRP. Yet another wooden animal balancing game from HABA, the German powerhouse of kids’ games. It may also be found under its German name: Tier auf Tier: Jetzt geht’s rund!. 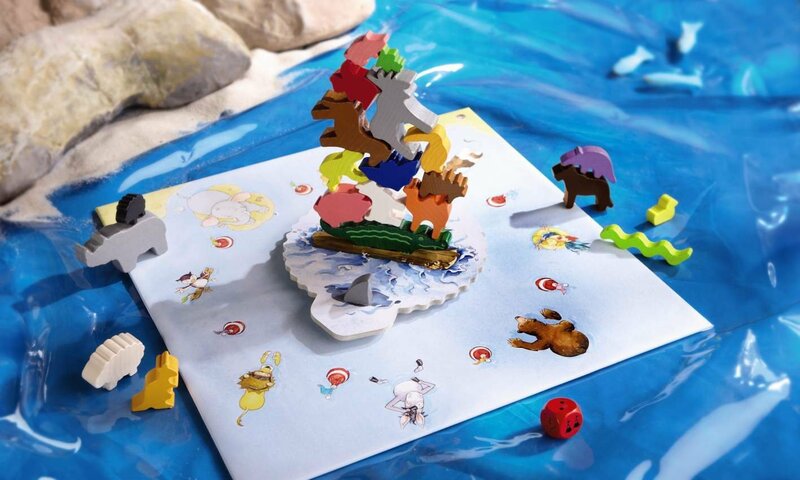 The game consists of a collection of different wooden animals (2-3 inches long) which players take turn balancing on a central wooden alligator. A die is rolled before placing which can allow other players to pick your next piece or even give you the chance to “pass off” your animal for another player to place. Knock off some animals and you have to take most of them back into your own pile. Try to be the first to place all of your animals to win. What makes this version of Animal upon Animal is the central balance disc. After each placement a player must rotate the disc one or more places without knocking off any pieces. A beautifully produced dexterity game with simple rules but enough challenge that it can be played with adults. For slightly older kids (6+) this is a die rolling game (remotely like Yahtzee) with a dungeon delving theme. One player rolls their hero dice while another player rolls the monster dice. 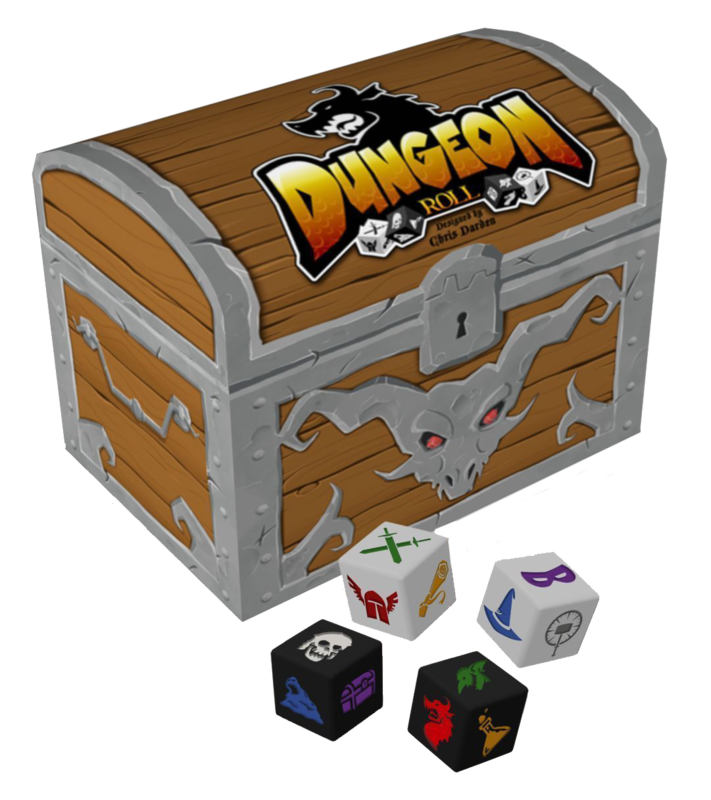 Hero dice are rolled once per delve and are used up as they try to eliminate more and more monster dice as the dungeon level increases. Monster dice have a “treasure chest” face which grants a player a draw from the treasure hoard, each of which grant special powers. The entire game has a “push your luck” element since failure to clear all of the monsters in a specific levels cause a player to lose all points for that round. After three rounds of delving for each player, the game ends and scores are compared. What makes it slightly different than many die rolling games are the character cards. Each player begins the game as a specific character (out of a dozen or so) which grants a special power. The game can even be played solo, just to see what kind of score one can achieve. The game gets high marks from my eldest (1st grade) son. Yes, this is another kind of Pictionary game, although without the game board. Two teams take turns trying to guess the word drawn by one of their members within a time limit. What sets this game apart is the extremely nifty drawing board. The game consists of a deck of cards, and a flat pencil-shaped drawing tablet with a green glowing window (batteries not included). 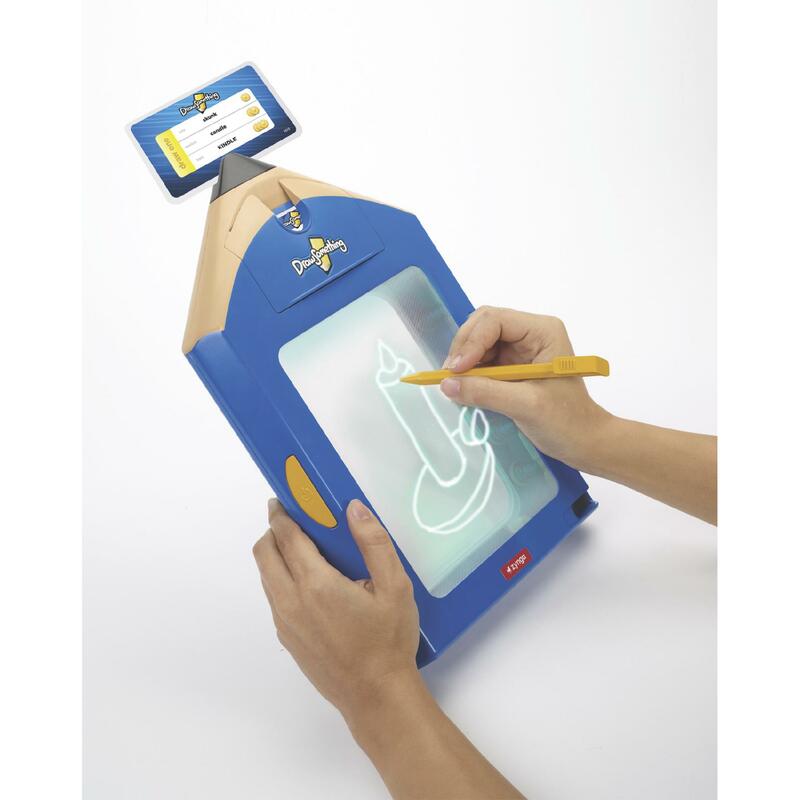 Taking a queue from those old clear plastic over black background drawing toys, the drawing tablet produces a sketch out of nifty glowing lines. With a quick press of a button, the drawing surface separates a moment and once again displays a clean slate. Another “push your luck” game by one of boardgaming’s leading designers. 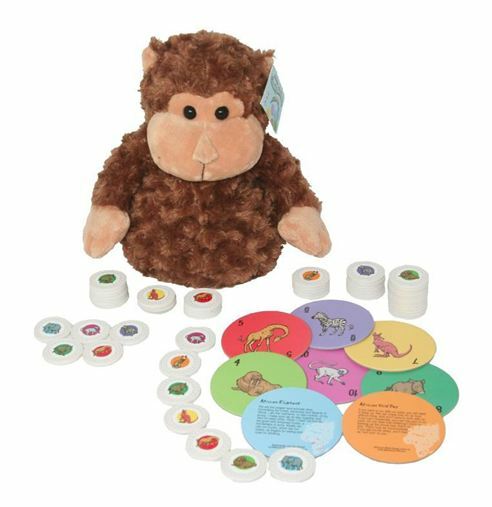 On your turn, you draw chips out of a bag (a cute plush monkey) until you decide to quit or draw a duplicate of ones previously drawn that turn. In standard push-your-luck practices, drawing a duplicate forfeits all the tokens drawn that turn (but not in previous turns.) Captured chips are placed in a stack in front of a player in a stack. However, the chip at the top of the pile can later be “stolen” by any player who draws that particular animal chip on their turn. As with any chips drawn on a turn, stolen chips are lost by a later duplicate draw. (Within our gaming group we call losing a stolen chip “poaching”.) Once all chips are drawn out of the bag, players score one point per chip plus bonus points are scored for having the majority of each type of animal. There is a nice bit of strategy involved since the bonus points for each animal is directly related to the number of those chips present. I’ve even played this game with more than 6 players but that is best only if everyone is in it for the enjoyment of the game and less concerned with trying to win. A popular freely available party game is known as Mafia or Werewolf, where one moderator runs a game between two groups of players. However, a player’s team secret from all the other players. In a typical game, a large number of townspeople try to guess who among them are werewolves. 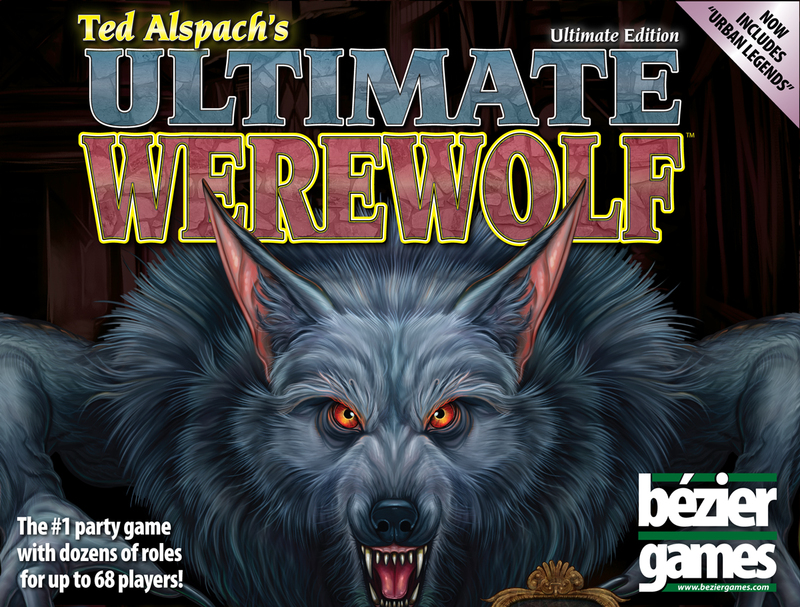 One game round consists of a night-time segment where everyone closes their eyes and the werewolves choose one person to “kill” (knock out of the game.) Everyone then “wakes up” and the group decides by a majority vote to “kill” one of their own (hoping to eliminate a werewolf.) The game continues until all the werewolves are eliminated or they become a majority within the town. What makes the game great are the discussions each day “I am not a werewolf!” – “Timmy is a werewolf because Billy accused him yesterday and Billy was killed in the night!” If players can’t enter in the spirit of the discussions the game will fall flat, but otherwise it is a great experience. While a game of Werewolf can be put together by a simple deck of cards, Ultimate Werewolf adds in a huge number of special abilities (the Seer, for example can find out if someone is a werewolf or not during the night – of course, good luck convincing everyone else you’re the Seer!). If everyone has some mild special ability it keeps the townsfolk interested as they still have something “fun to do” during the game. Ultimate Werewolf: Inquisition takes the same theme but provides a game that is played without the need for a central moderator. This game consists of six identical sets of cards, each in a unique color. Players take their colored deck and then proceed to throw a down on a central area and then draw a replacement. A card must land at least partially on top of another card or it is removed. The game lies in the various symbols on the cards. These symbols are activated on a players turn only if they are showing (not covered) at the start of their turn. Symbols that look like faces on dice score points. Other symbols change what you can do on your turn. Symbols will let players draw extra cards, throw extra cards, throw a card down that isn’t touching another card, rethrow a card just thrown, even take another player’s card and throw it on the board (upside down, of course) for them! A very fast-playing game that keeps everyone involved, it has a nice balance of skill, strategy, and luck. A great stocking stuffer, this game consists of a deck of only 16 cards and a few tokens. Players start with a single card in their hand. On their turn they draw a card and then play one. The goal is to end the round with the highest valued card. Simple enough, until the special ability of each card is taken into account. One card allows a player to look at another’s hand. Another card will eliminate a player if you can correctly guess what card they hold. The highest valued card is, of course, the most coveted but if you ever are forced to discard it, you are instantly out of that round. When a player has won a specified number of rounds, they are declared the winner. Love letter is a great, short game of deduction and bluffing – just the right size for someone’s Christmas stocking. Not a new game, but one I came across this year which was a big hit in my household, this game is instantly recognizable by the cute little plastic volcano on the side of the board. It plays in two distinct parts. 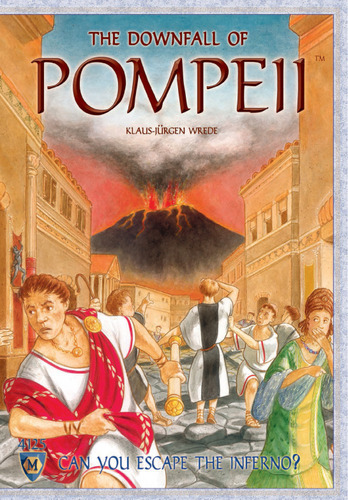 First, players use cards to place their people onto the city of Pompeii, vying for strategic locations as well as trying to take advantage of previous player’s moves. As the city fills, at some point the volcano erupts and the game changes into a race to flee the city. Players now take turns both adding lava tiles to the game board (deadly as well as blocking exits) and then moving their pieces trying to escape. Of course, any piece overtaken by lava is ceremoniously thrown into the volcano! After all the lava tiles have been drawn, the player with the most escaped people is declared the winner. Pompeii is a great game for families and friends who can take a little bit of ribbing. Fleeing from the encroaching lava is clearly the most (darkly?) hilarious part of the game. Another darkly hilarious game is Unexploded Cow. England has too many cows with Mad Cow’s disease? France still has some unexploded ordnance from previous wars? Sounds like a great opportunity for an enterprising person. Players take turns placing cow cards (which requires spending money in a central pot) down in front of them in their “herd”. A die is then rolled and is used to count around the table to see which cow “explodes”, disarming the ordinance and collecting a cash reward from the pot – some cows have additional special abilities. 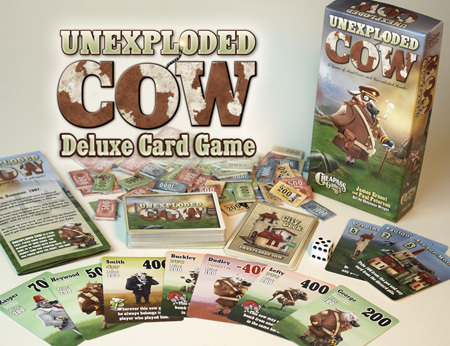 If your own cow explodes on your turn, you also gain the current central city card which grants various instant bonuses like drawing more cards or stealing money from the pot. The game ends after the last city card is claimed and the winner is the player with the most money. It isn’t a particularly deep game but there is plenty of player interaction, and then there’s the quite hilarious theme and artwork. Several years ago, a new style of card game appeared called a deck-builder. In a deck-building game, players start with a small number of cards and then use those to purchase more cards to add to their deck – reshuffling whenever they run out of their draw pile. Thus, a player’s deck of cards becomes more and more powerful as the game progresses. 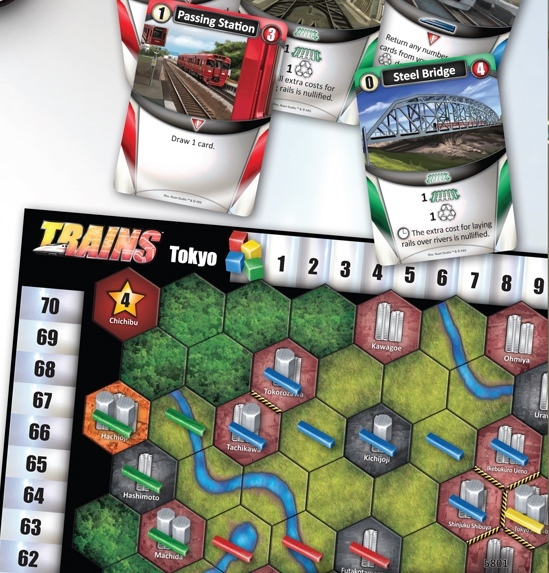 Trains takes the mechanic of a deckbuilder, but then creates a game centered around placing pieces (trains or stations) onto a game board to score points at the end of the game. Players can pay to purchase cards, pay to add tracks to the board to connect to cities, or add stations in a city. Points are scored at the end of the game for connecting to cities with stations, although some cards are worth points just be being present in your deck. What complicates everything are the Waste cards. Nearly everything a player does will force them to add Waste cards to their deck, which do nothing but clog up their deck with useless cards. Waste cards in your hand can be eliminated by giving up your turn, but this is obviously not going to get you more points. 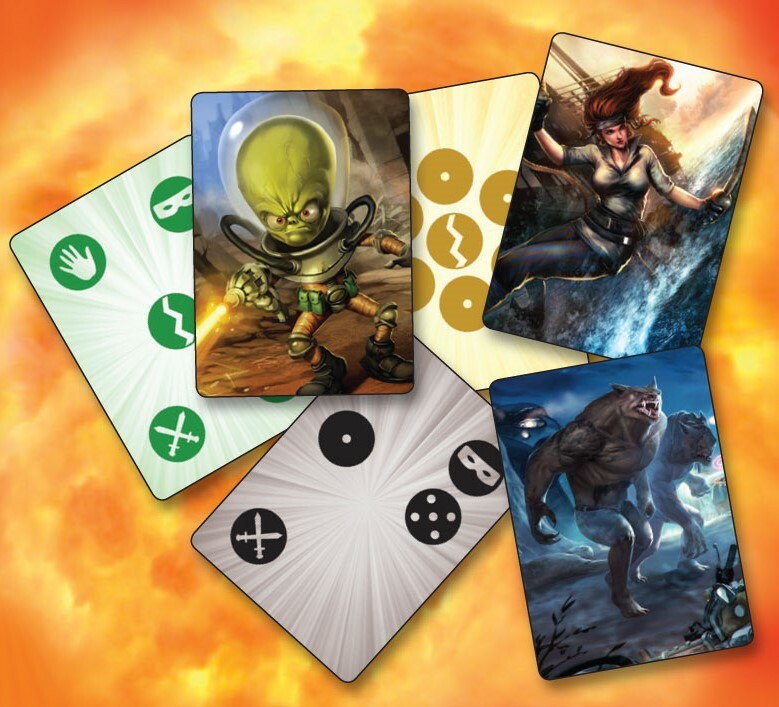 As with any deckbuilder, only a few of the many available card types are used in a particular game (and this game also has two different game boards – one front and one on the back) making the game quite varied. No two games will ever be exactly alike. If one can get past the frequent card shuffling in any deckbuilding game, I highly recommend Trains as the game board helps new players to focus in on what to do with the many card options available. Space Cadets is a timed cooperative game where each player takes on a particular job trying to coordinate the flying of a spaceship (reminiscent of a crazy Star Trek simulation). Space Cadets came on the scene just a bit too late to be included in last years holiday guide. However, I brought it home to my extended family and it was a huge hit amongst the nieces and nephews. One nephew went so far as to have his whole birthday party centered around the game (receiving it as a present and having several activities based around the game.) The team tries to accomplish a specific mission (which can vary, depending on the scenario chosen), which almost always includes some ship to ship combat. For their assignment (and with fewer players, some players will take on multiple roles) each player has a little “mini-game” they play in order to complete their tasks. The Engineer provides power to the other players (making their jobs easier in the next round) by putting together a puzzle as efficiently as possible – the matching symbols on the puzzle dictate who gets what power. The shields guy will take a few tokens and try to create the most optimal poker sets (via numbers) and place them on each side of the ship to form the strongest shields possible. Tractor beams are run by a memory matching game, targeting is done by pulling the correct puzzle pieces from a bag, and torpedoes are launched by first forming tangrams and then flicking a wooden disc down a path. The pilot meanwhile plans out a route on the game board to hopefully get as close to the enemy as possible while keeping the correct shield facing and avoiding any obstacles in the way. All this must be done simultaneously within a time limit. The game seems quite random and chaotic, and it is; but it is also a hilarious amount of fun. Good natured yelling and accusations fly when players fail their task or are simply the victims of poor communication. Often, positions are forcibly changed mid-game, but the new players find out their new job is far more difficult than they expected. This fall, a new game has appeared in a similar vein – Space Cadets: Dice Duel. While I have not personally played it, it looks to be nearly as fun and plays in a much shorter time frame. Based around rolling dice, two teams of players frantically jockey their ships around each other in real time, trying to defeat each other. Perhaps even more chaotic than the original, but that isn’t necessarily a bad thing. These are games for the more serious boardgamer. These have a few more rules and take a bit longer to play. However, they can be the most satisfying games to play for those willing to spend the time sitting at the table. Slightly more complex than what I’d consider a family game, Tzolk’in is a worker-placement game with a unique twist. Rather than taking an action by placing a worker pawn on the board, you get to take the action when you remove it. Workers are placed on the game board (which has four rotating dials connected to a large central one) and the longer you leave them out, the more powerful their action becomes. As in standard boardgames of this type (Eurogames), players use their workers to gain resources and then turn them around to gain points in a variety of ways. 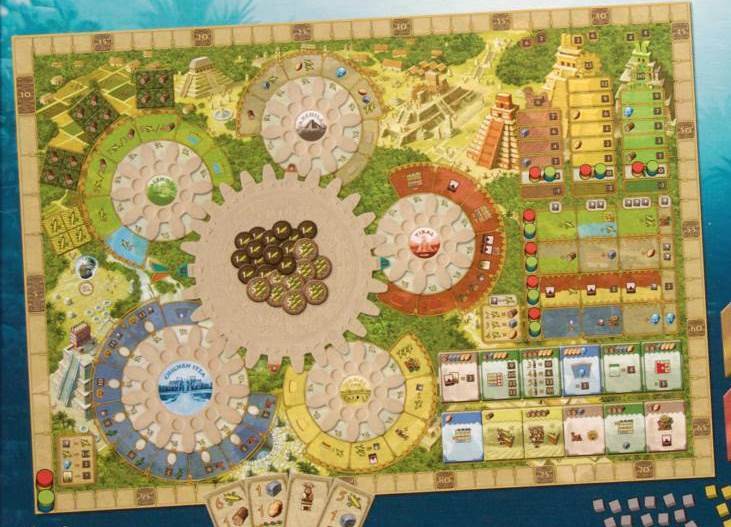 Both the dial mechanism and the beautiful production values of the game – both artwork and pieces – set Tzolk’in apart from this year’s crop of Eurogames. One of those few games that are games first and educational second. Several attempts have been made to make “games” about slavery in the US, but this is the first game by an experienced game designer. 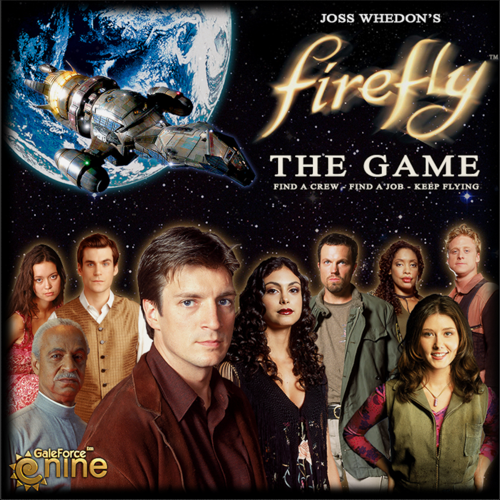 One to four players cooperate to free as many slaves as possible along the Underground Railroad while the game itself provides the challenge through slave-catcher dice and other events. I particularly appreciate the extensive background information at the back of the rulebook which only adds to the educational value. 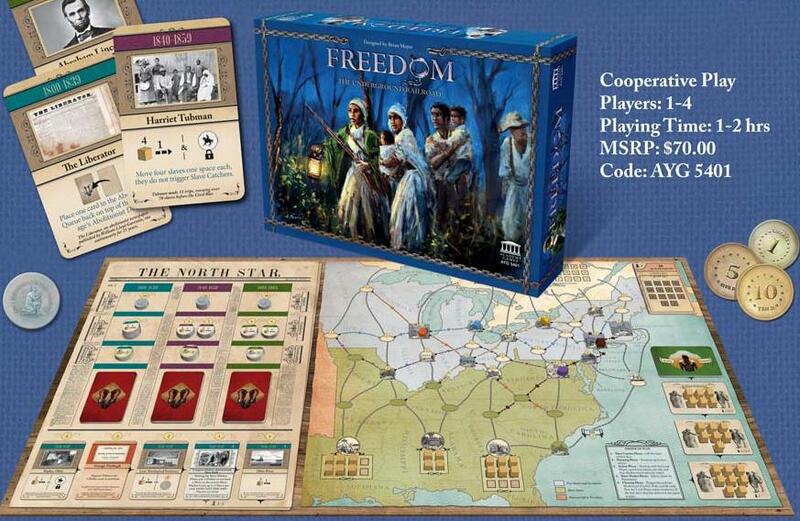 Freedom: The Underground Railroad is one of a few games that provides engaging game play while also instructing players about an important moment in history. Fans of the TV series will find much to like in this thematic pick-up and delivery game. Wander the solar system, upgrading your ship by adding parts and people while trying to avoid the Alliance and the Reavers. Several scenarios are available, which dictate the winning conditions of the game – it may simply the most cash or may be meeting a set of requirements. Fans of the game will appreciate all the little nods to the series, making the game well worth their time and money. However, those people who have not seen the TV shows may find the game moving a bit too slow for their tastes. Duel of Ages 2 is part exploration wargame, and part role playing game. Players set up in two teams, controlling one or more characters with unique strengths. (A special nod to the creators for using artwork that shows female characters in appropriate dress.) Some characters may be more combat oriented while some are skilled in other areas. The game consists of characters moving around a hexagonal board, avoiding the other team, and attempting to visit quest sites which provide challenges (those skills coming into play again) and their associated rewards. The team who has acquired the most achievements during the game is declared the winner. One of the most attractive parts of the game lies in the unique characters taken from history. Spartacus and Napoleon teaming up to take out Blackbeard and El Cid. If mixing your future and past characters isn’t enough, there is even a fan-made online character creation tool that will let you build yourself (or someone else) into the game. The basic set uses nearly all the rules of the game and should be plenty for most players. However, the expensive Master Set expansion adds in more of everything – more characters, more quests, more map tiles, etc… so the die-hard fans will have plenty of game to explore. The game’s main drawback is its length, however if you can handle the 2 hour timeframe, you have a fun character-driven game with an entertaining story arc. As with video games, popular boardgames will often be followed with expansions that continue to spice up a favorite game. With the exception of Pandemic: In the Lab, all of these are expansions to recommended games in last year’s guide. Mage Knight: Krang ($20) simply adds a new playable character to the excellent exploration/RPG deckbuilder game: Mage Knight. The new unit, Krang, is a bit chaotic and grumpy – with his special powers tending towards planned variability. He also is particularly good at “recruiting” new units – at the cost of his overall reputation. Pandemic: In the Lab ($40) This expansion adds new roles, new events, and even an additional game board for curing diseases. 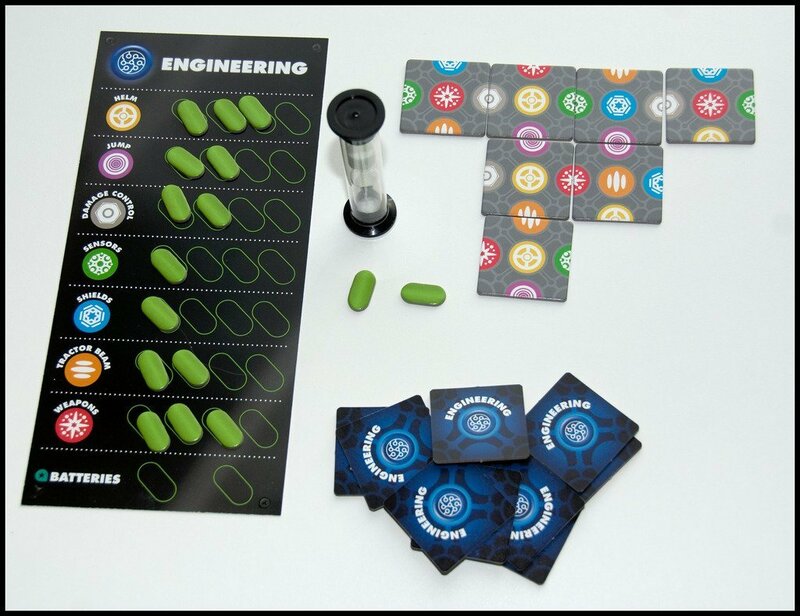 One particular stand-out in the expansion for the base cooperative Pandemic game is the chance for two teams (2-3 players each) to compete against each other for the victory. Lords of Waterdeep: Scoundrels of Skullport ($40) The two parts of this expansion can be added separately or combined with the base game for a marathon session. The box contains pieces for a sixth player. The two expansions are each centered around a theme. The Undermountain module adds in quests and other cards that represent that classic dungeon beneath the city. This module seems to take the base game and “kick it up a notch” with bigger quests and higher rewards. My favorite of the two is the Skullport module, it adds in a new resource, corruption. Players can often take actions in the game that are slightly more powerful than normal, but then must accrue corruption tokens as well. There is a corruption “track” that indicates the penalty for each corruption token at the end of the game. In a sadistic twist, the more corruption removed from the track (you can sometimes replace it), the larger the end-game penalty. Managing one’s long-term corruption levels while trying to take advantage of some of the short term corruption-granting gains makes the game more exciting without adding much additional complexity. RPGs have surged in popularity in the past couple of years. If someone in your life shows a leaning towards imagination, creativity, or storytelling, an introduction to the world of role playing games might be in order. Here are a few examples spanning a wide variety of types and recommended ages. I’ve mentioned this kid-focused low-budget RPG several times this year. It is hands-down the best treatment of a fantasy RPG for kids – simple enough for my preschool son to play. While the base game has all the rules and a starter “adventure” for $6, I highly recommend just buying the larger $10 or $15 package of additional adventures – cheap even at that price. 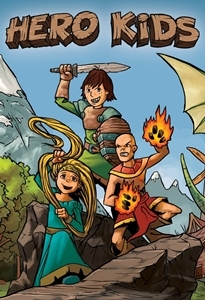 Each adventure not only contains the background story and information to play the “bad guys” but the adventures also contain maps of the adventure and paper cutouts of the monsters that can easily be printed out to help kids’ immersion in the game. 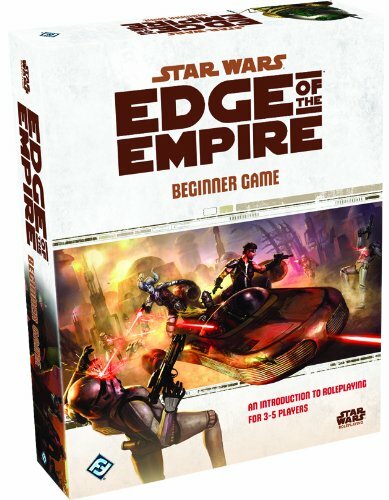 The introduction set to a new(ish) Star Wars role playing game produced by Fantasy Flight Games. In a typical FFG lavish production, the mechanics of this game center around a special set of dice in order to try to reduce “rules overhead” on the part of the players and help move the game along. 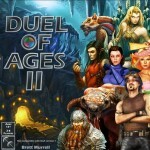 Wizards of the Coast has finally entered the new century and has begun releasing a large number of their old, classic titles as downloadable PDFs at DnDClassics.com. In addition, several hardcover books of particular favorites have been released. 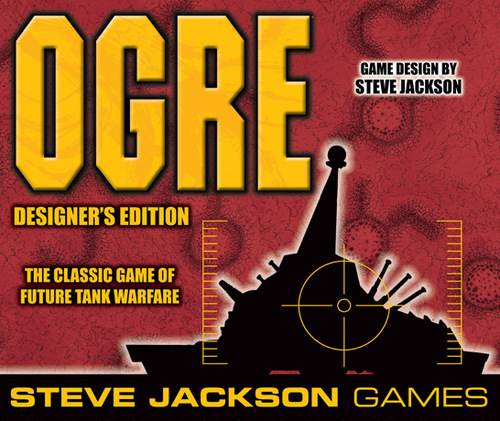 In addition to premium editions of old core rulebooks, several adventure collections have been released. 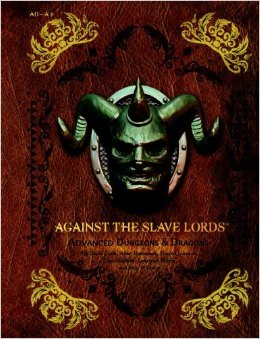 My favorites include Against the Slave Lords (containing all 3 classic adventures plus a new “adventure 0”) and Dungeons of Dread (several classic dungeon-crawl adventures in a single book.) Fans of older versions of D&D can rejoice as they can now obtain many of the old resources – and they don’t even have to clutter up their overflowing bookshelves! Finally we come to the “other” category, typically a catch-all of things amusing to me that aren’t quite boardgames. While a few things have passed by my plate this year, I’ve only taken a shining to one puzzle-like toy. 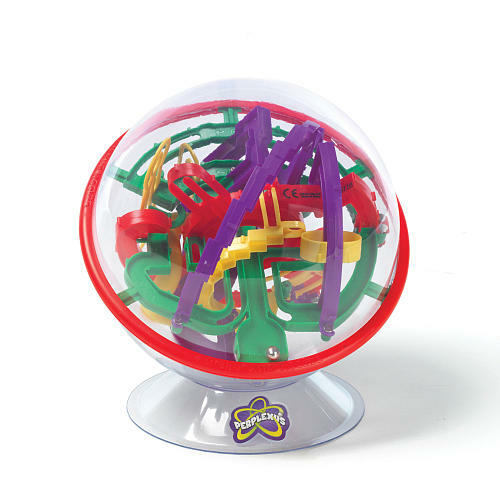 Perplexus (the original) has been around for a few years. 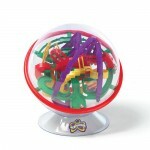 It is a plastic sphere containing a metal ball which travels through a maze as you rotate the sphere around. Think of those old wooden marble mazes you explore by spinning two knobs… only now in 3D. I found the puzzle to be engaging as the first few times it is played there are some nice puzzle aspects as you try to figure out where to go next in the maze. After those are figured out, there is still plenty of entertainment left to actually beat the puzzle and/or challenge yourself to a time limit. The puzzle now comes in four versions: Rookie – slightly smaller and more stable, is probably beatable by kids 7+; Original – a nice challenge for preteens on up; Epic – truly a challenge for most people, although beware that its slightly more fragile due to the crazy challenges that include tiny see-saws, among other things. The final puzzle is entitled Twist. This sphere has two sides that rotate, so not only must you proceed through the maze, you repeatedly have to rotate things so that you can cleanly hop from one side to another. No matter what toys and presents the holidays bring, be sure to keep time in your schedule for playing with friends and family. While the games here come highly recommended to provide fun for a wide range of players, there are plenty other choices available. Ask your local game store, check some of our past recommendations, or swing by the BoardGameGeek Gift Guide for 2013. Dave and I played Space Cadets: Dice Duel at Karl’s game day! It is indeed a very chaotic and fun game and also very short to play. I think it would be fun to try the original. I see that you are recommending Trains. Even though I am not normally fond of deck building games, I would like to give this one a try some time!